In 2015, millions of birds either died or had to be euthanized because of highly pathogenic avian influenza (HPAI). The approved methods of disposal for large-scale (catastrophic) mortalities include: burial, incineration, and composting. 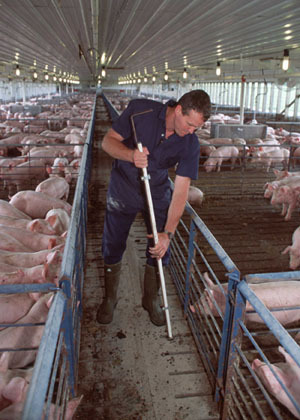 The swine industry has experienced significant losses as a result of PEDv, which can be transmitted through contact with manure of infected pigs. It is possible to move the virus between farms on vehicles, pumps, manure handling equipment, clothing, or any other item that comes in contact with manure and is not thoroughly disinfected between farms/fields. The low amount of viral exposure required to cause illness means that even tiny amounts of residual manure pose significant biosecurity risks. The National Pork Board has fact sheets, results of research, and a newsletter including biosecure manure pumping protocols for pork producers, for commercial manure haulers, and land owners. (Spanish versions of each fact sheet are available). The American Association of Swine Veterinarians released a technical, non peer-reviewed article summarizing PEDv. The sections on transmission and treatment/prevention (including a nice summary of disinfectants). Restricting access of off-farm equipment and personnel involved in manure pumping or manure application and thorough cleaning of equipment between farms are among the recommendations to follow to reduce risks of spreading manure-borne pathogens. North Dakota State Biosecure Nutrient Management. This fact sheet does an especially nice job describing how to manage and clean equipment used in manure handling around the farm. The National Pork Board released fact sheets on Biosecure Manure Pumping Procedures for farmers, commercial manure haulers, and land owners. The Maryland Department of Agriculture developed a brochure related to transporting manure and set out some guidelines to prevent the spread of pathogens. What should regulatory inspectors do when traveling between farms to prevent the spread of disease? What requests can farmers make of inspectors to protect their farm biosecurity? One of the best collections on composting animal mortalities comes from the Cornell Waste Management Institute. Check out their sections on health and safety and animal mortality composting for research on pathogen destruction and other safety considerations. The following resources are not focused on managing manure but give a great overview of the larger biosecurity issue and practices on livestock and poultry farms. This farm worker follows the farm biosecurity protocol and is wearing coveralls and boots that are cleaned and laundered on-site.